ZL908 mini wheel loader is a quality and efficient small wheel loader with 0.8 ton rated load.The size of the dimension is 4200*1600*2550mm with very small turning radius,it is very flexible and multifunctional to be used at farm,private garden. 1, ZL908 mini wheel loader equipped with China Changchai ZN390 engine 25KW,mature hydraulic torque converter and fixed-spindle power shift transmission. 2, New design of the cabin and engine hood makes it more attractive. 3, Articulated steering structure with very small turning radius makes it competent for narrow space application. 4,The standard size of the tyres is 10-16.5 and the bigger tyres size 31*15.5-15 can be equipped for option. 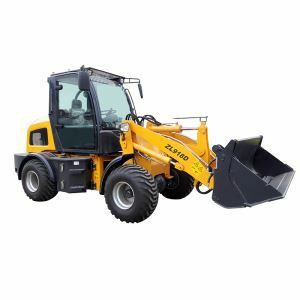 ZL908 mini wheel loader is an agricultural wheel loader which can be attached with various kinds of attachments like pallet fork,4 in 1 bucket,snow blade,auger,grab bucket etc and it is widely used at farm works.